ENTER SWEEPSTAKES HERE – Eggland’s Best Sweepstakes page. ENTRY LIMIT – Limit one (1) Game Play/Entry per person and per e-mail address per day (where each day begins at 12:00:01 AM ET and ends at 11:59:59 PM ET, as determined by Sponsor’s clock) for the duration of the Promotion Period. ELIGIBILITY – Open only to legal residents of the 50 United States and the District of Columbia, Puerto Rico and Guam who are 18 years of age or older and who have reached the legal age of majority in their state, jurisdiction or territory of residence at the time of entry. 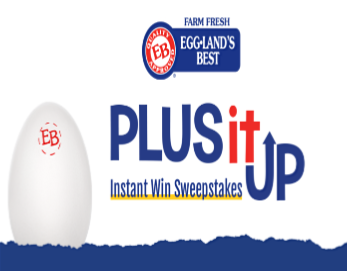 SWEEPSTAKES ENTRY PERIOD – The Eggland’s Best “Plus it Up” Instant Win Sweepstakes begins 12:00 AM Eastern Time (“ET”) March 12, 2019 and ends 11:59 PM ET June 25, 2019. Third Prize: $50.00, awarded in the form of a $50.00 pre-paid debit card (certain terms and conditions as specified by issuer apply) (ERV $50.00). Fourth Prize: One (1) Eggland’s Best full-value coupon redeemable for one (1) dozen eggs (ERV $4.50). Grand Prize package (1): The one (1) Grand Prize winner will receive $5,000.00, awarded in the form of a $5,000.00 check (ERV $5.,000.00), one (1) fitness tracker (in a size and color determined by Sponsor) (ERV $149.95), one (1) swag bag which includes Life Time® and Eggland’s Best branded gear as determined solely by Sponsor (ERV $250.00). The total ERV of the Grand Prize package is $5,399.95. 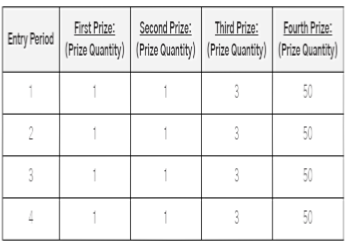 WINNER’S LIST – The name of the Grand Prize Drawing winner, and the First, Second and Third prize Instant Win Game winners (available after July 31, 2019) and/or a copy of these Official Rules may be obtained by mailing a self-addressed, stamped #10 envelope to: Eggland’s Best “Plus it Up” Instant Win Sweepstakes – Winners/Rules (please specify which), P.O. Box 295, Gainesville, VA 20156, for receipt no later than September 30, 2019. VT residents omit return postage on rules requests.